The New style portable light not only has an excellent appearance, but also in excellent construction. Utilizes Epistar LED chip as light source, energy saving, 50,000 hours led life. Keep this rechargeable portable light in your car or toolbox,extremely convenience for outdoor activates. 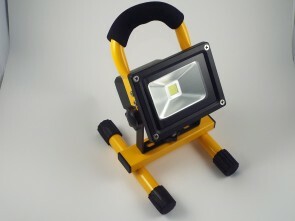 The portable LED floodlight also can be handy for working on a project, camping, exploration, engineering repair,emergencies and just general use. Comes complete with Battery, AC / DC charging adapters.